Jake, needs a forever home or foster immediately. Jake’s wonderful human person passed away 4 weeks ago and the family is not able to keep him. Jake is a sweet boy,we’ve been to adoption days and he was well behaved,walks good on leash and did well at PetSmart. 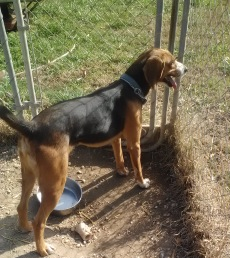 Jake is a young male plot hound,up to date on shots,heartworm negative and neutered . Please help Jake, he misses Miss Jean and needs love and attention.